The first stage of the Antares rocket stands on the pad at NASA's Wallops Flight Facility ahead of its February 2013 engine test-firing. A commercial spaceflight company is counting down to a key rocket engine test in Virginia tonight (Feb. 22) for a new private rocket designed for space station missions. 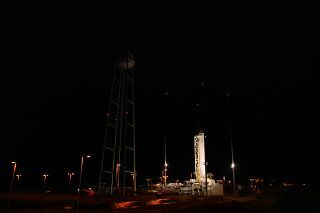 The Virginia-based company Orbital Sciences Corp. is expected to test-fire the first stage engines of its new Antares rocket at the Mid-Atlantic Regional Spaceport on Wallops Island, Va., between 6 p.m. and 9 p.m. EST (2300 and 0200 GMT). NASA's Wallops Flight Facility, also based on the island, is supporting the so-called static fire engine test, in which the Antares rocket will fire its engines without leaving the launch pad. "The test is a key milestone leading up to the first flight of the Antares rocket, which is preliminarily scheduled for about four to six weeks following the completion of the engine test," NASA Wallops officials said in a statement. The Hawthorne, Calif.-based Space Exploration Technologies (SpaceX) is the other company with a NASA contract for unmanned space station deliveries. SpaceX has a $1.6 billion contract to fly at least 12 missions to the space station using its Dragon space capsules and Falcon 9 rocket. The company launched both a test flight and a bona fide delivery mission to the space station in 2012. The second delivery flight under the contract is slated to launch on March 1. With NASA's retirement of the space shuttle fleet in 2011, the space agency is relying on new private rockets and spacecraft to ferry cargo — and eventually astronauts — to and from low-Earth orbit. NASA is currently dependent on Russia, Europe and Japan for cargo deliveries to the space station. Russia's Soyuz spacecraft are the only vehicles currently available to ferry astronauts to and from the station. Orbital's engine test tonight will mark the company's second attempt to check the Antares rocket's dual AJ26 rocket engines, which are designed to provide 680,000 pounds of thrust. A first attempt on Feb. 13 was aborted before engine ignition due to a "low pressurization" detection during a nitrogen purge in the rocket's aft engine compartment, Orbital officials said in an update. An Orbital Sciences Corp. Antares rocket is seen partially assembled ahead of 2013 test flight. Tonight's Antares engine test will take place at Pad-0A at the Mid-Atlantic Regional Spaceport, which is located on the eastern shore of Virginia. If all goes well, the test will set the stage for a full-up flight test of the Antares rocket, and then a demonstration flight as part of Orbital's contract under NASAs' Commercial Orbital Transportation Services (COTS) program. "Following the successful completion of the COTS demonstration mission to the station, Orbital will begin regular cargo resupply flights to the orbiting laboratory through NASA's Commercial Resupply Services contract," NASA Wallops officials said. Tonight's Antares rocket engine test will be visible and audible in the Wallops Island, Va., area. If you snap a photo of the engine test and want to share it with SPACE.com, send images, comments and location information to managing editor Tariq Malik at spacephotos@space.com. You can follow SPACE.com Managing Editor Tariq Malik on Twitter @tariqjmalik. Follow SPACE.com on Twitter @Spacedotcom. We're also on Facebook & Google+.